At this point in our given history, love for tacos is pretty ubiquitous. Show me someone who doesn’t love tacos and I’ll show you someone who’s lying. Either that or they have no concept of what tacos are. In that case taco love wouldn’t be ubiquitous and thus render my initial declaration null and void. You ruin everything! You know what can’t be debated though? My love for tacos. That’s on lock with Mary J. singing the hook. But, when I do conjure up images of tacos, I tend to lean towards the tacos of my youth. The “street” tacos. The late night taco stands of both Mexicali and Tijuana. Simple, inexpensive little vessels with simple toppings – never overly fussed. The recipe (and filling) itself is quite simple. 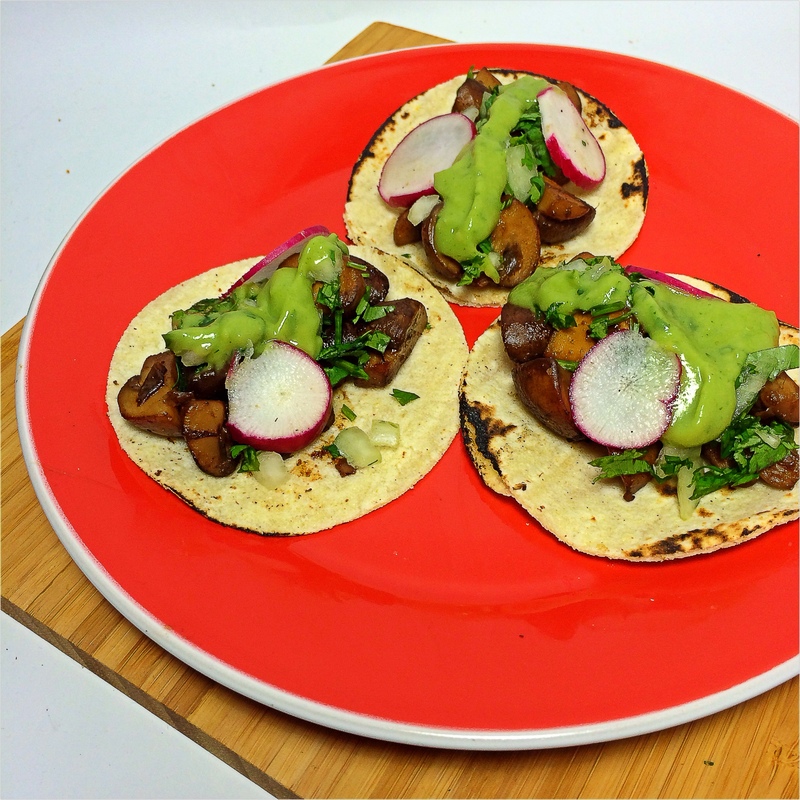 Mushrooms sweated down in bit of oil and finished off with a simple citrus-based braising liquid (bringing forth the flavors of a traditional asada marinade); from there (as an homage) I served them on small-sized corn tortillas and topped off with the toppings above. 1. Heat oil over high heat in a large frying pan, wok or stock pot. 3. Cook for 5 minutes (they will release a lot of their water); Stir occasionally. 5. When all the liquid has been released add your browsing liquid, stir well to incorporate and lower heat to medium. 6. Cook until the braising has essentially evaporated. Quick Note: Ain’t gonna front – Mushrooms are mad expensive sometimes. Two pounds of them won’t be cheap. So feel free to sub one of the pounds of Mushrooms with 3 cups (cooked) chickpeas or beans. Just cook the mushrooms up to before step 5 above; add your beans and saute for a few minutes then move onto step 6.